As the first week of the National Stand Down for Safety comes to a close, it is important that as employers we recognize the efforts that workers have shown, especially those who show safe behaviors through everyday tasks. Regardless of your company’s size, safety should be a priority; this is why the Industry Safety Week exists. Safety Week gives companies a unique opportunity to work towards reducing worker fatalities and injuries in innovative ways to improve your safety culture. Evaluate the safety culture of your business. Ask yourself and your workers, what is working well? 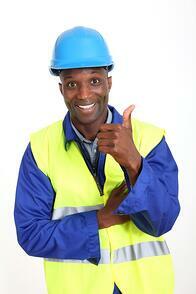 Do workers feel safe on the worksite? What can be done to improve the safety culture? Attend an upcoming safety stand-down meeting or host a safety meeting for your company. OSHA offers free information on a number of safety related topics that can help you organize a meeting. Review your training requirements and make sure everyone has up to date training. Hold an emergency drill; run through the drill and invite emergency response teams to assist in emergency preparedness drills. Show your gratitude towards you workers for supporting safety. Observe and recognize the effort they have put forth to create an injury free workplace. The safety week website is full of clever ideas and helpful tools to help create your own event. You can click the hyperlink to download this book. Schedule Self-Audits or Third-Party Audits to evaluate any necessary changes. Hold discussions with your leaders on the importance of safety self-awareness in the workplace and strategies they can use to promote a safer environment. For more information on bettering your safety culture in the workplace, download our free safety manager’s guide to effective safety training.